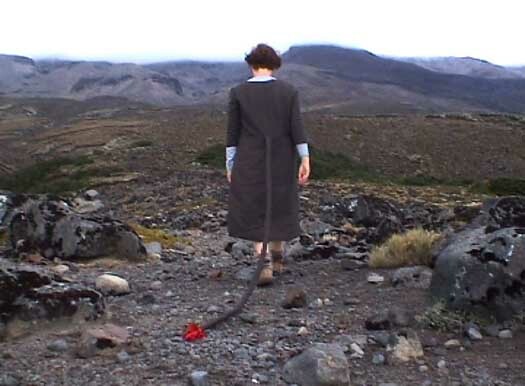 by Catherine BagnallIntroducing a new recurrent feature on artists' and designers' projects is New Zealand artist Catherine Bagnall's poetic recounting of her performances in the wilderness…. Two years ago in white - out conditions, sometimes thigh deep snow and freezing winds I crossed Oturere Crater in the pale blue bridesmaid dress and a yellow fur hat. (1) The Emerald Lakes had frozen over and lost their edges to an almost unperceivable perfect grey. In the whiteness I had a solidity that the mountains lost to the snow. With my yellow fur hat and pale blue against the white, I felt I had links to Russian princesses. The day before my heavy red gown with pink detailing and sparkly sequined cardigan shone out against the snow but I was so cold I didn’t know what I felt. The weather overwhelmed everything but my huge skirt billowed out and flapped loudly and sounded curious up there. Last year I climbed Mt Arthur in an old white brocade wedding dress. It collected the weather and mud and became heavy , I also carried a possum fur muff. In Paradise Valley I swirled around in a pale blue tutu and last week I wore a brown dress with a long tail and a white dress with a hood and satin ears high up on an alpine plateau. As an artist and a lecturer in a fashion school, my practice draws on aspects of performance through which I explore issues surrounding pleasure, and think through the problematics of making visual my relationship to ‘wilderness’ landscapes – more precisely some areas in the National Parks of New Zealand. In my work I am hunting for sensations, new ways of finding and feeling pleasure and clothing has been a large part of this experiment. 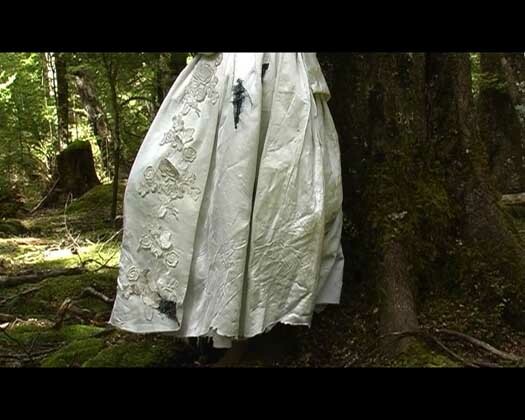 For the past several years my practice has involved undertaking long walks (tramps) in remote parts of New Zealand during which I experiment with the wearing of both artefactual and inappropriate clothing: old wedding frocks, my grandmother’s clothes, garments that I have made with ears and tails attached and so on. In these walks I strive to become something ‘other’ than what I think I can be, to transform into something else – a bird, a fox. This idea of other, of transformation or metamorphism is part of a literature canon dating back to Ovid’s great poem Metamorphoses. Marina Warner suggests that this tradition of fiction is integral to not only feeding our imaginations but functions also as part of our understanding of theories of self and models of consciousness. (2) She explains, using the example of the double or monstrous alter ego, that such metamorphosing potential works paradoxically as not only a threat to personality, but the double “also solicits hope and dreams for yourself, of a possible becoming different while remaining the same person, of escaping the bounds of self.” (3) Warner further suggests that metamorphoses happen at points of intersections, between boundaries. Metamorphosis is engendered by border-line conditions; it is cultivated in-between. If margins and borders are conducive to such transformations, then clothing may be an especially productive site. As a kind of transitional frontier, it marks the boundary between self and non-self through its physical and psychological operations. Clothing can embody powers of metamorphosis; it can be a tool for ‘becoming something else.’ The transformations that dress enacts may be large or small, fantastical or ordinary, monstrous, disciplined or liberating. I thought these were useful ideas for exploring the visible elements of femininity in wilderness landscapes and the complexities of my relation to the concept of nature. A lot has been written about clothing in an urban context and very little about clothing in the wilderness landscape. “Expansive! now there's a word I love, it spreads all over the beating heart of the romantic sublime, defines it, now you're talking my language,” writes my friend Jane who is an art historian and writer and a recent collaborator. “To me, transformation is more idea than phenomenology and I just couldn't feel it - though I could see it - wonder what that says about our different approaches?.....and the clearing, how can that expand?” she writes. Jane and I are still discussing a project we undertook together where we travelled to Paradise Valley a remote spot in the isolated central South Island of New Zealand. Together we went; Jane with her moleskin notebooks, pencils and recording devices and myself carrying a lot of clothes and a camera. We went to see if we could put into visualisation a feminine sublime in a New Zealand wilderness context and I was also experimenting to see if I could transform into something ‘other’ using clothing and exploring what a female pleasure in looking might feel like. In Paradise Valley we spent seven days in a small rodent filled one room hut with no power or running water surrounded by beech trees and huge mountains. The nights were so thick and dark that we peed only metres from the door in the dewy grass. We had gone with the intention of walking but instead we spent our week there sort of trapped, or at least not leaving a small clearing that the trees outside our hut opened onto. In Paradise Valley Jane asked me what I thought about the concept of the self in relation to feeling. I had been reading Barbara Vinken and thinking around her idea that the division between being and appearance constitutes one of the major conceptual articulations of fashion. I was thinking about what ‘being’ actually means, looks like or feels like. I decided that it was feeling that was important. I can’t imagine a self without feeling. Feeling the wind and enjoying the feeling of feeling. I was and still am curious to see if looking could be an agent for feeling. My desire to effect what artist Roni Horn calls ‘an intensification of being’ is an ordinary human goal to be sure. Roni Horn also travels to ‘wilderness’ locations in Iceland for her projects. She is hunting for a space outside gender somewhere where she says pronouns don’t detain her. I dress up in a hyper-expressive collection of mostly dresses and I think I am hunting for a heightened sense of being, of feeling pleasure as a female – in fact a middle aged woman in the bush. My clothed body moves through and sits still amongst the beech trees and alpine tussock grasses. In the process of performing with these elements, I strive for a union between my body, textile and natural world and, of course failing, I try again and leave behind a trail of art works. It is in these works of video and photos and writing that I seem to be reflected back at myself as part landscape, part animal and part garment. Jane asked me why I chose to take the clothes I did to Paradise Valley. Soft pinks, pale blues and white against green that I find sensual. I thought a lot about the colour of the clothes I took and how they would look against the Southern Fiordland forest and about their textures. I chose pink trousers and a thick satin white skirt and red Yoji dancing shoes. A pale blue sequined tutu for twirling in and an old petticoat to add volume and rustle to the skirts. A possum fur muff for the pleasure of feeling fur - sticking my hands into fur. A hooded jacket and a thick cable knit jersey for warmth and layers. I like looking and feeling warm and lumpy. A dress I had made with pink ears and a tail to explore becoming animal in. My beautiful Martin Margiela long, three- fingered wool gloves. And finally my old man black wool pants. I had worn them a lot; they’re too big, with a huge baggy bum; I know they look bad but I feel good looking bad. And they’re warm. I filled our hut with my clothes and laid out they were an extraordinary mixture of colours and textiles with links to the past and potential possibilities. Barbara Vinken has called fashion a poetological activity that thematises itself and has performative power, one that represents a relationship between the designer and those who wear the clothes. (4) The performative power of clothing interests me and here I see a connection or blurring of boundaries with art. Both have the potential to shift and question how we see ourselves in relation to our environments – or to what we can become. In my brown dress with a tail I don’t become a tailed animal and the gap between me and tailed animals is wide. But I do feel a huge respect for animals and like them I need also the forests and clean air to live. Of course one does not need to dress up to feel the awe and respect I feel for these vast areas of landscape that do not need me. But I feel such a joy in dressing up in the mad clothes I have made and found and being in the forests in these garments gives me a sense of happiness and well being that I sometimes struggle to find elsewhere. I take these sensations back to my house and my partner, my back yard, and my cat glow. Kate Soper argues that we need new ways for finding other pleasures and desires and “alternative outlets for ‘transcendence’ that are not provided by Western Industrialist consumerist culture …. which …. remove us from a natural simplicity or immanence, rather than return us to it,” (5) if we do want to maintain a world that both humans and non humans can happily and healthy continue to live in. She argues that even if could we continue to exploit and consume as we do, it would not necessarily enhance human happiness and wellbeing. From her writings on ‘alternative hedonisim,’ (6) I am interested in her ideas of developing new modes of satisfaction that do not necessarily require goods but rather new modes of experience that are possibly more sensory, sensual and slower than what we usually give value to. “I don't really want to become an animal with a tail.................I just like being in the bush dressed up because I feel expansive simple as that.” I wrote that to Jane two weeks ago after being up at the mountains in a white silk dress with ears and tail and elaborately embroidered fur muff that I had made. I am now thinking that a sensation of “expansion” whether through feeling or sight though certainly not a new human experience, maybe an important one to strive for. When I feel expansive I feel a sense of wonderment and respect for and I guess love in and connection for my surroundings. Paradise Valley in the space of the clearing, through idleness and having the time to sit and think, we both decided that expansion and very simple ideas were vital. And my experience of spending ten days in a clearing watching the grass and sun and feeling things, I think has changed me. For years I thought I was seeking immanence – a complete collapse of myself to become more plant or animal or rock like, to be fully immersed into the trees but as Kate Soper argues if I really had the option for immanence I would have to renounce all my aspirations for philosophical or poetic transcendance. When I’m out there I don’t transcend my corporeal self; the wet skirt touches my legs and I am part of the landscape. Yet I expand and am transformed…my three wardrobes are full, and I believe. Because it is the being in it that I am interested in, the jouissance of being in the bush luxuriously dressed and feeling expansive in way that I am still struggling to articulate. When tramping with a heavy pack on my back I spend a lot of time looking down on myself, on the next spot to put my foot. I delight in looking down and seeing the satin or silk dress fabric outline my knee as I physically push myself. But mostly it is the colour of the fabric against the leaves, the mud, the tussock, the snow, and the alpine flowers. The sound of the fabric rustling and swishing, my fabric tail dragging through the moss trailing me, the smell of the bush and the feel of the whole experience… moving through it in a brown or satin dress. Being small in a space of enormity, beauty, perfection and it is hard and unknown. Maybe I’m just dressing up in reverence for it all. In the clearing I have come to realise that whether it be twirling or just sitting or lying, the clearing is a space for hedonistic small pleasures and a sense of expansion: a place to think and find different ways of being. Catherine Bagnall is a Lecturer in the Fashion Programme at Massey University’s College of Creative Arts in New Zealand. As artist her focus is on the intersection of fashion and performance practices and her recent work explores clothing’s ability to transcend and transform the wearer in ‘wilderness’ landscapes. Her work focuses on how clothing can offer revelatory experiences in feminine ways of being and becoming through representations of the clothed female body. 1) I admit that my sister’s red gortex jacket with the double zip front and Velcro tabs at the cuffs and borrowed crampons made the crossing possible but I am never out to kill myself just to see what can happen what else I can become. 4) Barbara Vinken, Fashion Zeitgeist: Trends and Cycles in the Fashion System (Berg:Oxford, New York, 2005),p.4. 6) see Kate Soper on Alternative Hedonisim.